Why do so many Catholics leave the Church when they become adults? I’ve met many older Catholics who are distressed because their adult children have fallen away from the Catholic Church and their grandchildren are not being raised in the Faith. Many of these older people are devout, daily communicants who don’t understand how this happened. Fr. Thwaites has an explanation. He tells of a man, “a great Catholic, the pillar of the parish, whose children had all lapsed, one after the other. They had all fallen away from the sacraments and from attending Mass.” The man admitted that once he had a family of his own, worldly distractions slowly but surely took the place of the family rosary. “When the rosary goes, the faith soon collapses,” warns Fr. Thwaites. As a little girl at home with my parents and four siblings, we prayed the rosary most evenings. By the time I was in high school, the practice had stopped. Since I was the second oldest child in the family, my much younger siblings didn’t grow up with the same experience. Now, I am the only Catholic among my siblings. The practice of praying the family rosary has largely been abandoned. We have saturated our lives with so many distractions and busyness that we have neglected the care of our families’ souls. Many parents have told me that they’re so busy they don’t have time to pray by themselves or with their families. I confess that until recently, it was much the same in my family. Homework, extracurricular activities, TV, internet, working long hours, fatigue, and lack of interest persistently threatened my family’s resolve to pray. Some evenings we allowed ourselves to be swallowed up by distractions and we failed to give our souls the sustenance they need. Sometimes it would take an act of will to tear ourselves away from the secular so that for a few minutes, we could focus on the eternal. About a month ago, I realized that family rosary time had become an afterthought, something we prayed maybe a couple of times a week. I’m not sure how it happened; it just did. We had let everything else become more important. My husband and I agreed that we had to get our prayer life back on track. We designated 8:00 p.m. as our family rosary time and everyone had to stop what they were doing and gather in the living room for prayers. We set the rule that the only people who were exempted were those who were too sick or those who were not home. It’s important that the children understand the significance of praying the rosary together. By prioritizing our evenings, we think the message is getting through. They have stopped trying to make the excuse that they have too much homework and while we still have our struggles, they gather in the living room willingly. It’s difficult to coordinate family rosary time on the weekends but we encourage the kids to pray on their own. On a designated day each month, the Shrine of Our Lady of Fatima is passed on to our home. The next day, we pass the shrine to the next family on the list. On the day that we have the privilege of hosting the image of Our Lady, we pray the family rosary while displaying the Shrine. 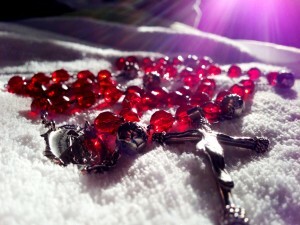 Many saints have written about the power of the rosary to protect against the devil. Saint Padre Pio called it the “weapon for these times.” Saint Josemaria Escriva urged us to “use it with confidence.” Saint Louis Marie de Montfort promised that “if you say the Rosary faithfully until death, I do assure you that, in spite of the gravity of your sins you shall receive a never-fading crown of glory.” Saint Therese admitted that ” the recitation of the rosary is more difficult for me than the wearing of an instrument of penance,” but she persisted with the sure hope that Our Blessed Mother knew her good will. A family that falls away from the Faith is a destroyed family, no matter how successful or upstanding it appears to the world. Nothing accelerates that destruction faster than the absence of the rosary in family life. In our families, how are we going to answer Pope Francis’ question? Can we give him the answer we know he wants to hear or do we have work to do? The salvation of our families’ souls are our first priority. In our hands, we hold what is most powerful in achieving this goal: the rosary. So call your family together and pray the rosary today, tomorrow, the next day, and all the days after that. Pray it imperfectly. Pray from the heart. Pray with your family.